Toronto LRT Information Blog » Blog Archive » Just Get Building! This entry was posted on Friday, February 18th, 2011 at 11:56 am	under Other Cities, General LRT. My idea is better, I’m canceling your idea. Your idea is stupid, I’m doing mine. No, my idea is better. Cal’s comment: We really have a silly system that contributes to nothing getting done. 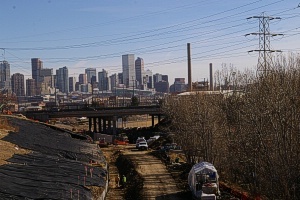 In Denver, there is a 1% sales tax that applies within the region serviced by the RTD for transit expansion. This was voted in place a number of years ago and provides funding with some reduction in political influence (though not totally). There is another edge to this sword though: Colorado’s sales tax is only 2.9% and then various municipalities charge their own (the city and count of Denver charge 3.62% on most things). There can be additional sales taxes in some areas that add another 0.1% here and there. One can pay a different sales tax rate simply by shopping at the store across the street. To see what I mean, take a look at this page. Will Transit City be cancelled for sure? If not, will it be watered down and/or reduced in size? First, the name “Transit City” is dead. In the game of politics, Ford said it was dead and even if everything were to continue exactly as planned, changing its name still allows him to claim he killed Transit City. Second, the centre part of the Eglinton line is to be built underground, which does not conflict with Ford’s desire to have no more in street construction. I suspect that phased funding will push back extensions to this line (Don Mills to Kennedy, and Jane to the Airport) to the point where a new administration more open to the original plan will naturally select it because of the cost benefits over staying underground. The one wrench in this is that, with some luck, Metrolinx won’t get bitten with the ICTS bug and move towards building Eglinton (and upgrading the SRT) with ICTS Mark-II technology. On the plus side, Ford’s “must not be in traffic” mantra might work out well in that we may get a side-of-the-road alignment from the east portal to Don Mills, and a better arrangement of tunneling and elevated line at the west end to Jane. Third, the cost of upgrading the SRT to ICTS Mark-II is comparable to converting it to LRT and extending it to Sheppard. Later extension to Sheppard, let alone Malvern will be much, much later, or more likely never, if the ICTS upgrade is done. Fourth, Sheppard is an interesting beast to cancel. A subway instead of an LRT is all well and good, but it will only follow Sheppard until it reaches Kennedy. Will an LRT from Kennedy to Morningside (or Meadowvale or even the zoo) be built? Who knows? Finally, Finch West seems dead, at least for now. Will the changes designed for the Spadina extension station at Finch and Keele still have a roughed-in LRT platform. Who knows? Hi Calvin, I’m of the pessimistic group who feels there will be very little building done, if any after JUST some of them are complete. One thing, the subway to Vaughan may not be completed there…I think it will just go to Steeles with no Yonge at all. Why? Well, first of all budgetary problems in all governments. Toronto just recently passed their 2011 budget with major cutbacks to many departments including the TTC. However, we are now being told that 2012 will be budgetary armageddon. Cal’s comment: Interesting observation. The funding for the Spadina Subway extension was set aside in a segregated account several years ago, but the contingency for cost overruns is fast being eaten away. I can see cutbacks having to be made. As much as I would like to see it stop at Steeles (heck, I would like to see the whole thing built as an LRT project, but I digress), I’m not so sure that can happen too easily. York Region is kicking in part of the municipal third of the funding and it may not be so easy for them to pull out, which they would want to if it won’t be built in their municipality. While I suspect it will be built all the way to Highway 7, with some cutbacks, the kicker will come when it begins to operate. Toronto will collect the fares and pay the cost of operation, but this will see a loss from day one. Maybe this will turn into 30 minute headways for trains north of Steeles! And if you make cuts to taxes and other promises to the electorate and then go begging to Queen’s Park using transit as one of the reasons why you need money from them, there’s something wrong. And the province was right saying that there is no more money and that the city was given the right to tax, so use it. Sounds vaguely familar to what a previous mayor was told by the same government (not defending either one, just pointing it out). WHO CARES WHO LEAKED THE LETTER! IT’S ALL BECOME POSTURING AND POLITICAL. And the reaction of the new mayor was something to the effect to get out the “Ford Nation” to defeat the Liberal government.That will just make the rest of the more anti-Toronto at election time.Sounds also very third persony. Finally, Calvin, open up your site to the Port Authority site for Pittsburgh. Take a look at the notice for the route restructure for March 27,2011. Not because of declining ridership but because of shortfalls in the monies that were to come from the state, there is a major shake up in Pittsburgh. Elimination of almost 30 routes along with several that are being cut, 1 bus division to close down completely, and 180 THAT WILL BE LAID OFF!! Don’t think that could happen here?Sorry, anything’s possible and these people (Ford,etc.) are Harris disciples. Was he not the one who cut funding for Eglinton after a tunnel was partially done.? TTC then had to fill back the hole.So, definitely read Pittsburgh and try to find a way to forward this to Steve Munro. Thanks and good work!!! I’m glad that we didn’t just get building. Toronto was THIS close to making the biggest investment mistake in its history via pushing through the untested Transfer City plan. Eglinton needed to be built as a subway line and I will never buy the argument that it cannot support one. With the high associated costs of digging a tunnel, just biting the bullet now and going with subway technology there seems like the wise and logical thing to do. Cal’s comment: Your use of the name “Transfer City” is very ironic. The issue with building something as full subway is that extensions to it must be full subway and the further out one extends it, the harder it becomes to justify full subway technology. At some point, future transit expansion will have to change to another mode, and thus add a ‘transfer’ at each end. Eglinton’s numbers for at least the next 30 years, let alone now, do not justify full subway technology. However, the fully isolated section of Eglinton can easily be expanded to handle up to 24,000 ppdph at a minimal cost (extending the ‘finished’ portion of platforms roughed in now, purchasing more vehicles for longer trains, and possibly adding Automatic Train Control). This will provide a substantial overlap with what full subway can provide (10,000 to 36,000 ppdph) and do so for less money over all and much less money up front. The high cost of digging the tunnel from Laird to Keele is not wasted on this technology. LRT leaves the flexibility to extend this further for a lower cost in a way that does not have to remain in a totally isolated right of way. Just because one day the need for 20,000 ppdph between Dufferin and Bayview may be needed (and we won’t have even half that thirty years out), does not mean that we should be building an infrastructure capable of over 30,000 ppdph for the entire distance from Kennedy Station to Pearson Airport. If it were decided to build Eglinton as full subway, mark my word that the initial project will be cut back to only involve the Keele to Laird portion, or even less. Any future expansion will either be with another mode, such as LRT, or will be a piece here and a piece there as a subway extension once every five or ten years, if ever. We have been living this reality for over forty years: let’s expand the subway system, but we can’t build a whole new line anywhere, so we’ll just add another kilometre. Then, council fights for a couple of years over who’s constituency gets that kilometre. The fight goes on until some backroom deal is worked out. Even when we finally actually built a new subway line (Sheppard - everything else has been an extension of what already existed, including the initial Bloor line), it had to be cut back drastically and involved a back room deal that took other projects such as the badly needed Downtown Relief Line off the table. Nothing in life worth doing comes easy. We might get fewer kilometres overall of mass transit under the Ford Transportation Plan but at least it’s offering passengers full grade-seaparation which enhances speed, reliabilit, security and climate-control of the service. Now is the time to “Just get building”, because the democratic will of the citizenry, our preferrence for subways, has finally been catered to. Thanks Mayor Ford. That’s the attitude that has brought us to where we are now. If anyone is really serious about this city’s subway needs, they would be calling for the Downtown Relief Line (at least the eastern portion with connections to both the University and Yonge lines, out to the Bloor-Danforth line somewhere from Pape to Coxwell and continuing up to Eglinton at Don Mills). That said, subway is not the universal solution for every corner of the city. Sure, many people will say they want subway because that is all they know. If I asked the same people if they would like me to give them $20, I suspect most if not all would say ‘yes’. Then I could make the claim that they prefer to be given $20 over $100 - never mind the fact they were unaware of the $100 offer. The province really ought to shift the funding for Transit City to Mississauga and York Region and have them build some rapid examples of LRT. Toronto needs a case of LRT envy that would result from that.